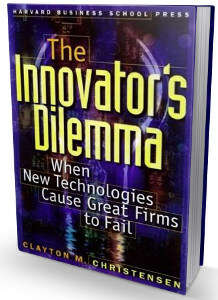 The Innovator's Dilemma: When New Technologies Cause Great Firms to Fail, generally referred to as The Innovator's Dilemma, first published in 1997, is the best-known work of the Harvard professor and businessman Clayton Christensen. It expands on the concept of disruptive technologies, a term he coined in a 1995 article Disruptive Technologies: Catching the Wave. Clayton Christensen demonstrates how successful, outstanding companies can do everything "right" and yet still lose their market leadership – or even fail – as new, unexpected competitors rise and take over the market. There are two key parts to this dilemma. Value to innovation is an S-curve: Improving a product takes time and many iterations. The first of these iterations provide minimal value to the customer but in time the base is created and the value increases exponentially. Once the base is created then each iteration is drastically better than the last. At some point the most valuable improvements are complete and the value per iteration is minimal again. So in the middle is the most value, at the beginning and end the value is minimal. Incumbent sized deals: The incumbent has the luxury of a huge customer set but high expectations of yearly sales. New entry next generation products find niches away from the incumbent customer set to build the new product. The new entry companies do not require the yearly sales of the incumbent and thus have more time to focus and innovate on this smaller venture. For this reason, the next generation product is not being built for the incumbent's customer set and this large customer set is not interested in the new innovation and keeps demanding more innovation with the incumbent product. Unfortunately this incumbent innovation is limited to the overall value of the product as it is at the later end of the S-curve. Meanwhile, the new entrant is deep into the S-curve and providing significant value to the new product. By the time the new product becomes interesting to the incumbent's customers it is too late for the incumbent to react to the new product. At this point it is too late for the incumbent to keep up with the new entrant's rate of improvement, which by then is on the near-vertical portion of its S-curve trajectory. Through this compelling multi-industry study, Christensen introduces his seminal theory of "disruptive innovation" that has changed the way managers and CEOs around the world think about innovation. Shortly after the release of the book, Christensen "received the Global Business Book Award for The Innovator’s Dilemma and The Economist named it as one of the six most important books about business ever written". It also received the Global Business Book Award as the best business book of the year (1997). One criticism of the book by Ben Thompson is that the theory applies best to businesses with business customers. Thompson says that consumers are not as rational and single-minded as business customers, and hence are less susceptible to disruption. Thompson points to the iPhone as a consumer product that is not easily disrupted by a low-end disruption; Christensen maintains that the iPhone and Apple are good candidates for disruption. The term disruptive technologies was first described in depth with this book by Christensen; but the term was later changed to disruptive innovation in a later book (The Innovator's Solution). A disruptive innovation is an innovation that creates a new market and value network that will eventually disrupt an already existing market and replace an existing product. Since the book was published, various articles have been written, both critiquing and supporting Clayton Christensen's work. The Innovator's Dilemma proved popular; not only was it reprinted, but a follow-on book entitled The Innovator's Solution was published. His books Disrupting Class about education and The Innovator's Prescription about health care both utilize ideas from The Innovator's Dilemma. ^ Christensen, Clayton M. (15 December 2015). "The Innovator's Dilemma: When New Technologies Cause Great Firms to Fail". Harvard Business Review Press. Retrieved 19 January 2018 – via Google Books. ^ Innosight,(2014). Clayton Christensen-Innosight Co-founder. [online] Available at: http://www.innosight.com/about-us/clayton-christensen.cfm [Accessed 15 Oct. 2014]. ^ Thompson, Ben. "What Clayton Christensen Got Wrong". Stratechery. Retrieved 1 November 2014. ^ Blodget, Henry. "Harvard Management Legend Clay Christensen Defends His 'Disruption' Theory, Explains The Only Way Apple Can Win". Business Insider. Retrieved 1 November 2014. ^ Christensen, Clayton (2011). The Innovator's Dilemma: The Revolutionary Book That Will Change the Way You Do Business. HarperBusiness. p. 336. ISBN 0062060244. ^ Christensen, Clayton (2003). The Innovator's Solution: Creating and Sustaining Successful Growth. Harvard Business School Press. ISBN 1578518520. ^ Christensen, Clayton; Johnson, Curtis; Horn, Michael (2010). Disrupting Class: How Disruptive Innovation Will Change the Way the World Learns (2 ed.). p. 272. ISBN 9780071749107. ^ Christensen, Clayton; Grossman, Jerome H.; Hwang, Jason (2008). The Innovator's Prescription: A Disruptive Solution for Health Care. McGraw-Hill. p. 496. ISBN 9780071592086. Jill Lepore, "What the Theory of 'Disruptive Innovation' Gets Wrong", The New Yorker, June 23, 2014. This page was last edited on 17 April 2019, at 14:20 (UTC).